Takahiro Ueno is one of the top D1 drivers. 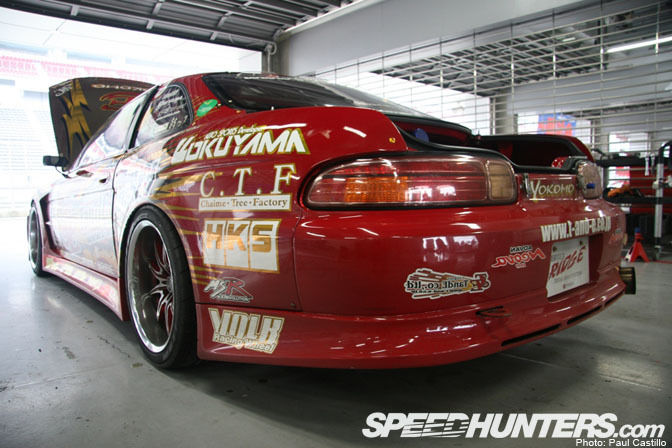 This JZZ30 Toyota Soarer has seen a lot of abuse but is always maintained to the highest possible level. Responsible for that are Ueno’s own companies, T&E and Sui:Vax. T&E is the company behind the Vertex body kits, while Sui:Vax builds the engines. 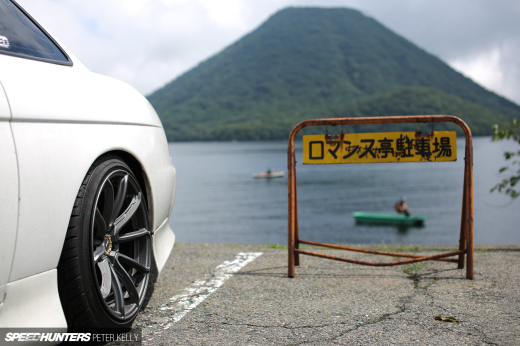 Paul Castillo from Japan was kind enough to share these pictures with us. 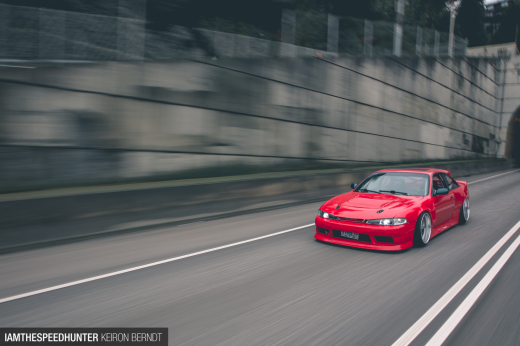 Expect to see more of his work in the future on Speedhunters. We see that the older 1JZ engine has been replaced with a 2JZ sporting a 1JZ cylinder head making it a 1.5JZ. Together with the HKS To4Z turbo the car makes more than 600ps. Also note the rebuild inner arches to accommodate larger wheels and more steering lock. A better close up of the HKS turbo; you can also see the Sui:Vax plaque on the engine cover. The paint on the cover is the signature color for all Sui:Vax build engines. How cool does this setup look? A ATL Safety Fuel Tank and Bosch fuel pumps make sure that the engine won’t run out of fuel under heavy conditions. Like I said in the intro, T&E has provided the car with the body kit. This particular kit is called Vertex Ridge and consist of a front bumper, side skirts, rear bumper, front fenders and canards. What we don’t see is the trunk with the SARD GT wing. 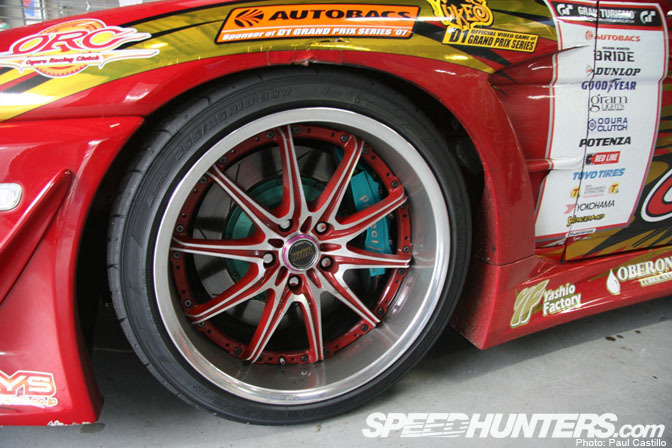 Ueno has changed the Volk GT-V rims for these color coded GT-F rims. Behind the rims you see the updated brake system by Project MU. In round three of the D1GP, Ueno made a mistake and parked his car backwards in the wall. I guess he will be making some late hours in the garage to rebuild the back for the Tokyo Drift event in Odaiba on the 7th and 8th of June. 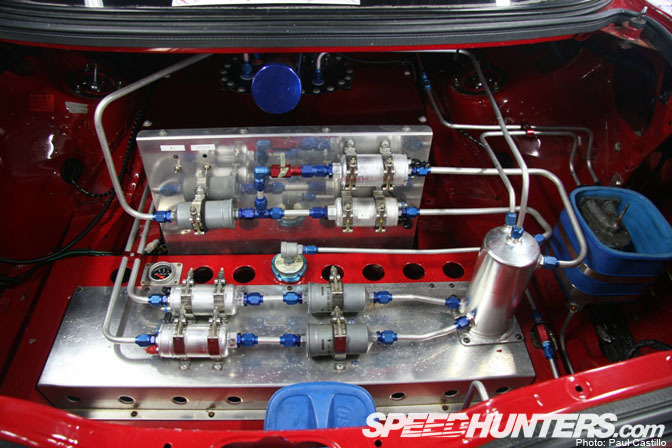 i dont understand the overly complicated fuel pump setup, but i appreciate how cool it looks.